What Is Biotin And How Does It Prevent Hair Loss? How Do I Choose The Best Biotin Shampoo? Can Biotin Shampoo Help With Hair Shedding? So, Which Biotin Hair Loss Shampoos Are Best? You woke up this morning, took a shower, and after glancing in the mirror, you noticed that your hair is beginning to thin. You blame it on age, after all, you are getting older, right? While age is a prime factor in hair loss, there are other common causes of hair loss that may be factors, one of which is a Biotin deficiency. We have researched the best biotin shampoo brands, examined customer feedback and did our own investigation. We discovered that the best biotin shampoos contain additional ingredients to combat hair loss. Our top pick Lipogaine Big 3 Shampoo has shown to give most people thicker fuller hair. The Only Clinical Proven Ingredient For Hair Loss . Contains Biotin. Mild Shampoo. NO Sulfate, NO Parabens. Contains Emu Oil As a Moisture To Ease Dry Scalp. Biotin is water-soluble vitamin B7 that is also known as “the hair growth vitamin”. Many clinical studies have proven that Biotin helps support your hair, nails, and skin. Furthermore, a Biotin deficiency can lead to many health issues, including hair loss. Hair contains proteins, and one common hair growth protein is Keratin. These proteins create amino acids as a result of a cell reaction with Biotin. Biotin helps maintain and support protein infrastructures, which allows for new cell formation It also helps the skin, digestive tract, and metabolism while combating breakage. It is also found in foods, such as Peanut butter, Organic Meats, Eggs, Avocado, Cauliflower, Berries, Fish, Legumes, and Mushrooms. Depending on the severity of your hair loss, you may be able to get away with trying to add more Biotin-rich foods into your diet. Consuming healthy Biotin-rich foods as well as using our recommended shampoo can help repair damaged hair while promoting follicle health. Our top brand is a great product that can also make your hair feel softer while improving overall texture. We selected only the products that were top-rated by consumers, that contained natural ingredients, and that has been tested and clinically proven to help treat hair loss and stimulate hair health. Our top pick Lipogaine Big 3, is the best hair growth shampoo that contains biotin. The manufacturer claims that it helps prevent premature hair loss and breakage while stimulating natural hair growth. In addition to Biotin, Big 3 also contains Ketoconazole, Niacin and Copper Tripeptides. Our testers found that the mild formula was both color safe and gentle on the scalp. It has a very light scent that works well for both Men and Women. A high-performing shampoo conditioner system designed to treat hair loss. Organix is designed with a powerful combination of collagen and hydrolyzed wheat helps add volume, thickness, dimension and also strengthens the hair. It has proven to help strengthen hair (and skin). Customers have claimed that they have seen thicker, stronger, and shinier hair. Organix products are safe for color-treated hair, all hair types in both men and women. They are not tested on animals and do not contain sulfates, parabens or any other harsh additives. Nourish Beaute claims that Vitamins Shampoo is the only natural hair loss treatment for men and women clinically proven to provide significant results. The proprietary formula is made with Procapil, organic castor oil, and coconut oil. Procapil is derived from a patented formulation of Biotinoyl Tripeptide-1, Oleanolic Acid, and Apigenin that was designed in Europe. Hair Loss Vitamin Shampoo backed by science, and is proven to improve scalp circulation, prevent fungal buildup (which kills hair roots), blocks DHT (dihydrotestosterone) and strengthens hair follicles. It is also doctor recommended for treating Alopecia. Finally, Nourish Beaute provides a free hair guide, and also offers a 100 percent money-back guarantee on every purchase. Mill Creek Botanicals biotin shampoo is designed with a therapeutic formula that contains Biotin, Panthenol, Aloe Vera, Peppermint and Argan Oil to help cleanse and remove buildup from the scalp, strengthen hair follicles and hair strands, and promote a healthy hair and scalp. Mill Creek Botanicals is known for being natural and organic. 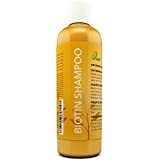 Mill Creek Botanicals Biotin Shampoo Conditioner system does not contain any parabens or phenoxyethanol, sulfates, artificial colors or fragrances. Mill Creek Botanicals hair loss shampoo conditioner system claims to be a true organic formula, however, some ingredients may be questionable.For example, the product claims that it does not contain any “fragrances”, however, “natural fragrance” is listed. Pure Body Naturals Anti-Hair Loss Shampoo with Biotin is a quality Biotin-rich shampoo. Biotin is a key nutrient in Pure Body Naturals Anti-Hair loss shampoo and is also crucial to nail, skin, and hair health. Pure Body Naturals Hair Loss Shampoo is also infused with 14 DHT blockers. DHT is a testosterone derivative, which is known to interrupt the hair production processes and damage hair follicles, resulting in hair loss. Pure Body Naturals Hair Loss Shampoo contains Argan oil, Niacin (Vitamin B), Nettles extract, Saw Palmetto and a wealth of antioxidants that are proven to help stimulate healthy hair. Pure Body Naturals does not contain any harsh chemicals. The gentle formula treats many chronic hair conditions, including hair loss and seeks to reverse damage. Pure Body Naturals recommend working the hair loss shampoo into a lather and allowing to sit in the hair for at least two minutes before thoroughly rinsing. It is safe to use up to twice daily. Consistent use will help not only treat hair loss but also prevent further hair loss and damage. Pure Body Naturals is designed for all hair types and for both men and women. HoneyDew is a natural Biotin-rich shampoo that promotes maximum hair strength and thickness. It also contains a number of essential natural additives such as Biotin, Vitamin B5, Zinc, Argan oil, and coconut oil, just to name a few. The proprietary blend in HoneyDew works to remove buildup, block DHT, and cleanse the scalp and hair from dandruff, dried and dead skin, and scales. The formula then stimulates hair follicles and promotes circulation to encourage hair health. Beautiful hair comes from a healthy scalp and this comprehensive topical treatment encourages thick and shiny hair and also slows down the hair loss process. This scientific formula is suitable for all hair types including thick, fine, normal and coarse hair as well as straight, wavy or curly hair. HoneyDew is also non-GMO and GMP certified. It is also hypoallergenic, sulfate-free, and paraben free. It is also safe to use with most conditioners. Age is a common factor in hair shedding. In fact, Androgenetic alopecia or more commonly known as male pattern baldness (MPB) is responsible for more than 95 percent of hair loss in men. Although hair loss is often perceived to be a male condition, women actually make up 40 percent of American hair loss sufferers. A biotin rich shampoo can help with many of the non-genetic causes of hair loss by increasing the health of hair follicles. The top brands received between four- and five-star ratings on average. Despite the number of positive reviews recorded for each product, there were a handful of negative reviews. Of course, it’s important to consider both the pros and cons before purchasing or trying any product. It is important to remember that there will be positive and negative reviews for any product. Not every product will provide the same results for every individual. At hairlossable, we also only recommend products that are cruelty-free tested. Most of the products on our list above cost approximately $30 or less. The best products come with 100 percent money-back guarantees as well. If you have sensitive skin, allergies or a pre-existing medical condition or start to feel an itchy scalp you should consult with a dermatologist. In conclusion, dealing with thin hair, bald spots, dandruff, thinning hair or hair loss is nerve-wracking. Although age is a common cause for hair loss in both men and women, it doesn’t mean that this is what is causing hair loss for you. Proper hair care includes addressing any vitamin and nutrient deficiencies. The only way to find out what product works best for you is to try it. Regardless of whether you are combating thin hair as a result of age, male pattern baldness or DHT (dihydrotestosterone) levels or a Biotin deficiency, Getting stronger, longer, thicker, healthier and shinier hair doesn’t have to be a losing battle. Simply getting to the root of your hair loss problem might help turn things around. You don’t have to resort to costly and dangerous hair transplantation procedures or other hair loss treatments. The right product will help promote scalp health and allow you to look your best and feel confident once again, no matter how old you may be.